Microsoft Office 2010 will launch for business customers on May 12, 2010 and to the public in June. Since a lot of business customers passed up on Office 2007 many IT departments are looking at Office 2010 to refresh their MS Office deployments. 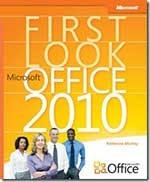 To help you get ready Microsoft Press for a limited time is offering “First Look: Microsoft Office 2010”, by Katherine Murray. It features 14 chapters about Office 2010. Find the download links at the bottom of this post. Here is what is included in the sample. Download this EBook from here PDF (10.5 MB) or XPS ( 27.9 MB) format. This is available only for a limited period.